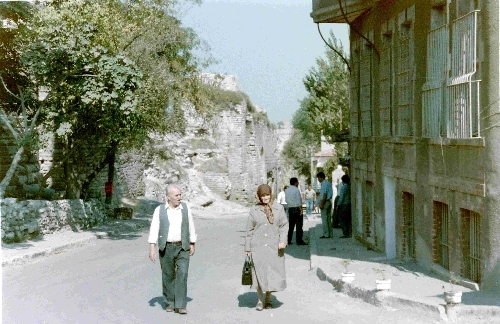 Street scene, Istanbul, summertime, long ago. I was wandering - it can't be called anything more organized than that - out by the ancient city walls after (I think, maybe before) visiting the Byzantine church down the street there. This was sheer randomness on my part: I walk by the street, see the shot, take it, walk on. Another shot taken close by. The crumbling city walls are in the distance. The lady is quite warmly dressed for mid-summer. At first, the picture did not stir me. As I look at it now, though, I really like it. You have the people in the foreground doing what random people in foregrounds do, talking up to people on the second floor or shining shoes or whatever. 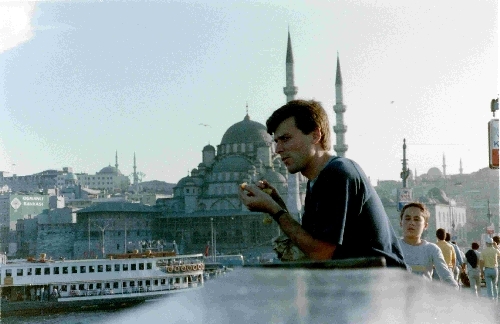 Then, you move up to the sublime, the church nicely framed, and up from there, if you look very closely, you get the heavenly, which are the minarets from the Blue Mosque barely visible in the far distance. 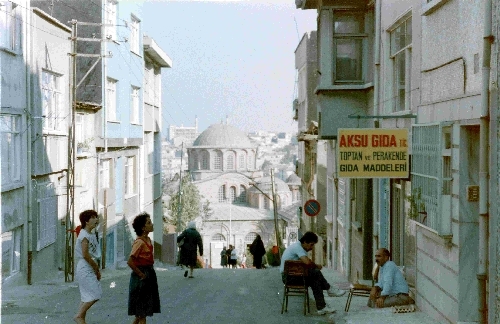 If I had all the talent and all the time and all the opportunity in the world, I would take this picture, go back to Istanbul, find this street, and create a painting of this scene. But, alas, the picture will have to do.